One of the parameters responsible for decreased water quality in a distribution system is temperature changes. 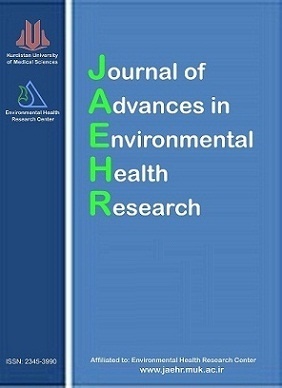 This study was conducted to examine the effect of temperature on pH, turbidity, and residual chlorine in Sanandaj, Iran, Water Distribution System. The required water samples were taken from 85 stations during April to October 2014. Sampling was carried out over 6 months and twice per month. The average amount of residual chlorine measured at these stations was 0.58 and 0.52 mg/l, and turbidity was 0.86 and 0.98 nephelometric turbidity unit (NTU) in winter and spring, respectively. The temperature did not have any effect on pH, the amount of pH in winter and spring were 7.56 and 7.57, respectively. The results showed significant differences in the concentration of residual chlorine and turbidity of Sanandaj Water Distribution Network between winter and spring (P ≤ 0.01). Thus, the concentration of residual chlorine and turbidity varies in warm and cold seasons. However, no significant difference was observed in pH (P ≥ 0.01). The research results indicated that temperature does not have any effect on the qualitative parameters measured in the study area. Bostani A, Golmaie SH, Ansari H. Pipe water distribution network modeling platform and by finite element method with Ansys and Plaxis. Proceedings of the 2nd National Conference on Water; 2010 Mar 19-20; Mashhad, Iran. [In Persian]. Stavros G, Vantas K, Tzimopoulos C, Christos E. Modeling distribution system water quality with hydrosim model. Proceedings of the 7th International Conference European Water Resources Association (EWRA); 2009 Jun 25-27; Limassol, Cyprus. Tabesh M, Azadi B, Rouzbahani A. Optimization of chlorine injection dosage in water distribution networks using a genetic algorithm. Water and Wastewater 2011; 22(1): 2-11. [In Persian]. Hassani AH, Jafari MA, Torabifar B. Trihalomethanes concentration in different components of watertreatment plant and water distribution system in the north of Iran. In ternational Journal of Enviromental Research 2010; 34(4): 887-92. Lu W, Kiene L, Levi Y. Chlorine demand of biofilms in water distribution systems. Water Research 1999; 33(3): 827-35. Qasim SR, Motley EM, Zhu G. Water Works Engineering: Planning, Design, and Operation. New York, NY: Prentice Hall PTR; 2000. Ndiongue S, Huck PM, Slawson RM. Effects of temperature and biodegradable organic matter on control of biofilms by free chlorine in a model drinking water distribution system. Water Res 2005; 39(6): 953-64. Institute of Standards and Industrial Research of Iran. Drinking water -Physical and chemical specifications. No. 1053. 5th ed. Tehran, Iran: Institute of Standards and Industrial Research of Iran; 2006. [In Persian]. Crittenden JC, Hand DW, Howe KJ. MWH's Water Treatment: Principles and Design. New Jersey, NJ: John Wiley & Sons; 2012. Power KN, Nagy LA. Relationship between bacterial regrowth and some physical and chemical parameters within Sydney's drinking water distribution system. Water Research 1999; 33(3): 741-50. Obi CL, Igumbor JO, Momba MN, Samie A. Interplay of factors involving chlorine dose, turbidity flow capacity and pH on microbial quality of drinking water in small water treatment plants. Water SA 2008; 34(5): 565-72. McCoy WF, Olson BH. Relationship among turbidity, particle counts and bacteriological quality within water distribution lines. Water Research 1986; 20(8): 1023-9. Lewis MJ, Bamforth CW. Essays in Brewing Science. Berlin, Germany: Springer Science & Business Media; 2007. American Water Works Association. Water Quality and Treatment: A Handbook of Community Water Supplies. 4th ed. New York, NY: McGraw-Hill; 1990. Ghanizadeh G, Ghanian MT. Evaluation of corrosion and scaling potential sources of drinking water in Noor city by using of corrosion indices. J Military of Medicine 2009; 11(3): 155-60. [In Persian]. Nemerow NL, Agardy FJ, Salvato JA. Environmental Engineering: Water, Wastewater, Soil and Groundwater Treatment and Remediation. 6th ed. New Jersey, NJ: Wiley; 2009. Governor Sanandaj. Detailed results of the general census of population and housing in 2011 [Online]. [cited 2011]; Available from: URL: http://ostan-kd.ir/Default.aspx?TabID=51 [In Persian]. Andalib A, Ganjidoust H, Ayati B, Khodadadi A. Investigation of Amount and Effective Factors on Trihalomethane Production in PotableWater of Yazd. Iran J Health Environ 2011; 4(2): 137-48. Powell JC, Hallam NB, West JR, Forester CF, Simms J. Factors which control bulk chlorine decay rates. Water Res 2000; 34(1): 117-26. Liu B, Reckhow DA, Li Y. A two-site chlorine decay model for the combined effects of pH, water distribution temperature and in-home heating profiles using differential evolution. Water Res 2014; 53: 47-57. Li X, Gu DM, Qi JY, M U, Zhao HB. Modeling of residual chlorine in water distribution system. J Environ Sci (China) 2003; 15(1): 136-44. Case ME. Determining the Relationship between a Water Sample's Temperature and Its Turbidity Level [Project]; California, CA: California State Science Fair; 2010. 2016. Ghorbani J, Moradianfard Sh, Reisi P, Shehni Gheysari M. Survey of heterotrophic bacteria population changes in Kerman drinking water distribution system and GIS zoning. Eur J Exp Biol 2013; 3(2): 476-83. Wang S, Qian X, Wang QH, Xiong W. Modeling Turbidity Intrusion Processes in Flooding Season of a Canyon-Shaped Reservoir, South China. Procedia Environmental Sciences 2012; 13: 1327-37. Shamsaei H, Jaafar O, Basri N. Effects Residence Time to Water Quality in Large Water Distribution Systems. J Sci Res Eng 2013; 5(4): 449-57. Liu B, Reckhow DA. DBP formation in hot and cold water across a simulated distribution system: effect of incubation time, heating time, pH, chlorine dose, and incubation temperature. Environ Sci Technol 2013; 47(20): 11584-91. Morris JC. The Acid Ionization Constant of HOCl from 5 to 35?. J Phys Chem 1966; 70(12): 3798-805.